Even as dusk falls, the shops along the main street, Untere Haupstrasse, in Freising, Bavaria in Germany still attract the people strolling by. Freising, in Bavaria, Germany has been the bishops' spiritual domain since 739, and the many historic buildings are proof of the cultural centre of yesterday and today. The buildings that house the shops on the main street, the Untere Haupstrasse, are a mixture of Gothic, classic and baroque styles.The shops along the main street of downtown are home to an assortment of goods such as shoes, clothing, toys and groceries. As night draws on, people still stroll through the downtown core where the lighted windows of the shops add to the old world charm of Freising.Shops along the main street - Untere Hauptstrasse during dusk in the City of Freising, Bavaria, Germany, Europe. 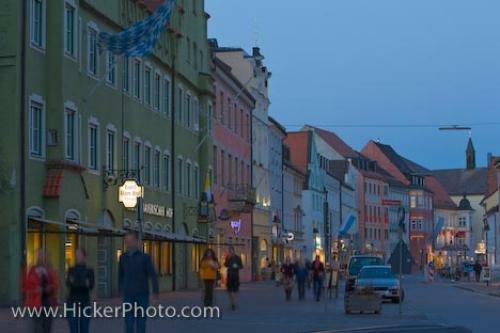 Photo of the people outside the shops along the main street of Freising, Bavaria in Germany, Europe at dusk.